Does the MIPS program partner with any other organizations and their funding opportunities for downstream assistance? The MIPS program has existed for over 20 years. Can you describe your outreach efforts to convey the program’s success? What quantitative measures are most effective to report to state legislators? The Maryland Industrial Partnerships (MIPS) program accelerates the commercialization of technology in Maryland by jointly funding collaborative R&D projects between companies and University System of Maryland faculty. 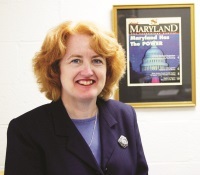 Since 1987, MIPS has connected more than 400 companies in Maryland with faculty in the University System of Maryland to develop products in the fields of biotechnology, nanotechnology, engineering, computer science, information technology, homeland security, defense, and energy. MIPS has funded more than 600 individual projects worth a total value of $164 million, resulting in sales of MIPS-related products of over $16.9 billion. This entry was posted on Tuesday, January 1st, 2008 at 12:00 pm and is filed under Podcast Interviews. You can follow any responses to this entry through the RSS 2.0 feed. Both comments and pings are currently closed.